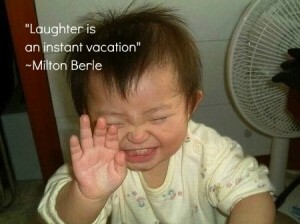 …posted Dr. Mercola, who posts “10 things that you should know about laughter” (click to read). My favorite is #3 – your brain can detect fake laughter. And isn’t that so true, it is like knives sometimes too when you don’t get a genuine laugh from someone. When I was younger I loved to get the “Reader’s Digest” out and read all the funny stories in the “Laughter is the Best Medicine” sections. In my own opinion I love to laugh and enjoy the laughter of others. I probably would not make it in Vegas but I have been known to have some jokes. The best laugh of course is the laugh of a baby just makes me smile and it is so fun to hear that joy in life. Where ever you are I hope that laughter is following your life or if not I hope it will soon.